The Ronald McDonald House is in constant need of supplies for the families staying at their House and visiting their Family Rooms. RMHC has a current wish list posted on their web site and it shows what items they need. We will collect items from now until our Service Event on November 11th. Please consider asking your friends, family, co-workers, neighbors, etc. to donate items and collect them for this effort. 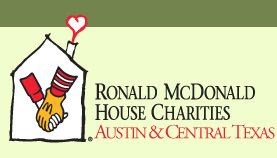 b) deliver the items directly to the Ronald McDonald House during our Service Event on November 11th.